Call me a dreamer, but I can envision a day when vineyards stretch out across the Midwest. In this future-land, the grapes from Midwest vineyards will be used to make wines that are sold across the country and the world. Could we be reaching the limits of a tourist based wine industry? Except for a handful of large regional wineries, the vast majority of Midwest wine is sold at winery tasting rooms and festivals. There is no doubt that millions of wine consumers value the Midwest winery experience. The challenge is how to convert Midwest wine tourists into Midwest wine consumers at restaurants and retailers. As reported in Midwest Wine Press, there is cause for optimism. More restaurants and retailers are carrying Midwest wines. Within the limitations of archaic alcohol regulations, wineries and wine associations should explore more ways to cross promote with restaurants and retailers. If just a fraction of Midwestern winery visitors carried their preference for Midwest wine home, the impact would be dramatic. Another big challenge for Midwest wine is sending a consistent message to consumers. As we’ve discussed before, there are too many conflicting, uncoordinated messages being sent to Midwestern wine consumers. If all the Midwestern wine organizations and associations worked together to send a powerful and cohesive message, the pie would grow for everyone. For a relatively small wine producing region, like the Midwest, there is simply too much time and money spent on futile cross border competition. And what might this unified message to consumers be? One possible marketing message is: “The Midwest can grow and make world class old world wines.” Michigan and Ohio are going this direction by heavily promoting vinifera wines. But can the Midwest grow old world wine grapes consistently on a commercial scale? As reported in Midwest Wine Press, the Midwest has 12,300 acres of wine grapes under cultivation. In comparison, Oregon has 20,000 acres of wine grapes. In other words, the third largest wine grape producing state produces 60% more grapes than our 650,000 square mile region. To reach the economies of scale that would allow the Midwest to compete on price, the Midwest needs to plant a lot of vines. But growing vinifera grapes in the Midwest is a challenge. On the other hand, hybrid grapes produce a relatively consistent crop in most parts of the Midwest. The drawbacks with hybrid grapes are poor name recognition and a negative perception among wine elites. Neither of these challenges is insurrmoutnable, however. A well coordinated marketing effort with contributions from all Midwestern wine producting states could create demand for hybrid wines. 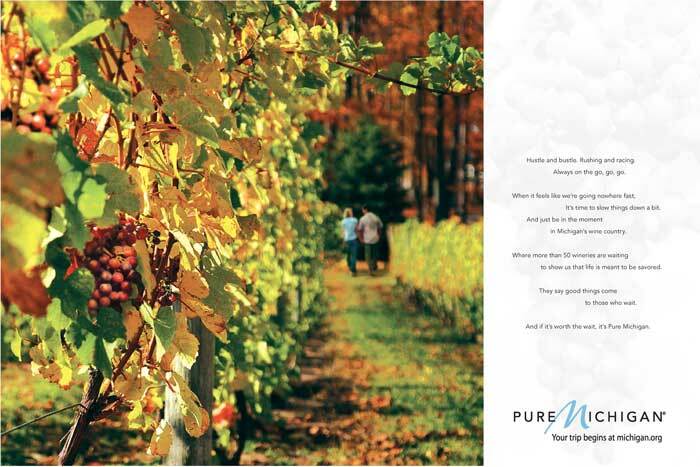 The Midwest is a world leader in agriculture and we can be a world leader in production of cold hardy grapes and wines. Let’s work together to make it happen. Great point of perspective Mark! Crossing that threshold may be a challenge for many reasons. I would imagine on the largest portion of wines sales is the under $12 wines. I’m not sure how the smaller Midwest wineries can compete with the huge marketing house wines, but hey I will defiantly be rooting for the underdog! Good article. A few thoughts since I am trying to come up with my business model for being a Garagiste and just got back from CA where I toured and talked with several small, artisanal vignerons. I think that there has to be some sort of Judgement of Paris type event with Midwest wines against other world class producers that really proves to the sophisticated wine consumers that the Midwest does have some very good wine makers working with both vinifera and hybrids. There has to be better marketing around the blends that are possible so that consumers do not focus on the varietals (allowing Midwest wine makers to use hybrids with no consumer repercussions). There has to be a more focused and coordinated effort to penetrate the metropolitan markets where the sophisticated consumers live. Having only one annual event a year will not raise the ongoing awareness necessary to create consumer demand. It is still puzzling to me that while consumers are fine buying local beer and spirits, they shy away from really embracing local wines. There is a disconnect that doesn’t make sense to me since there are many fine wines being made in our backyard. I think part of the problem with accessing the sophisticated consumers is the limited exposure to local wines and most likely an encounter with overly sweet products when compared to wines of other regions. Good article, Mark. I agree with these comments. Other obstacles are (a)new cold hardy hybrids may have unusual, unfamiliar aroma and flavors, so there is a learning curve for consumers, and (b)too many flawed wines are being sold. Just my observations. You have great insight and I’m also optimistic for growth. I’ve found that much of the stunted growth is related to the distributors who don’t actively promote local wines. The distributors will promote what is available, what has a higher profit margin, what is “hot” right now, and many local wine makers would benefit from a distribution company that focused on local products. There just aren’t enough of those.